Catherine McGuinness is chairman of the Policy and Resources Committee of the City of London Corporation. 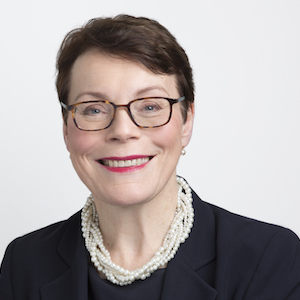 As chairman of the policy committee, Catherine is deputy chairman of TheCityUK, the promotional body for the UK financial services industry, and the International Regulatory Strategy Group. She is chairman of the City’s Courts Sub Committee, the body responsible for the management of the Old Bailey and the City of London Magistrates’ Court, which benefits from her substantive background in the legal sector. She has led the City’s work on education, chairing its Education Board and the City of London Academies Trust. Catherine has also been closely involved with the City’s cultural offer, having chaired the boards of the Barbican Arts Centre and Guildhall School of Music & Drama, and with the City’s relationship with Northern Ireland. She is on the board of London & Partners, the Mayor of London’s official promotional agency, and a commissioner on the IPPR Commission on Economic Justice. A solicitor by training, she practised in financial services law for several years. Catherine studied PPE at St Anne’s College, Oxford.